Are you still relevant tomorrow? Discover our vision for tomorrow and start today. We create, sort and identify ideas, opportunities and solutions. We translate trends and developments to a concrete policy, strategy or project. We write and execute killer project plans that get results and funding. Instruments and programmes for developing competences and behaviour. Entrepreneurs see business opportunities and grab them. Policy and education focused on promoting and supporting entrepreneurship have a possitive effect on the growth and the quality in SMEs. Important to increase their success and growth. CreativeMV provides policy advice for cities, regions, and nations on how to support SMEs and entrepreneurship as a key to ensuring economic growth, innovation, job creation, and social integration. The right to exist as a company lies in solving problems in new, applicable ways. 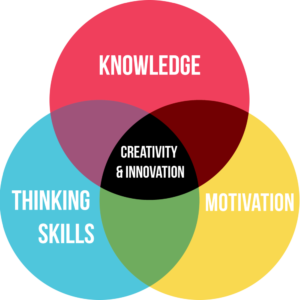 The need for the makeability of creativity finds its basis or the methods for creative thinking. Creativity can actually occur anywhere. More insight into creativity and the process, provides tools for companies and government policy to steer creativity and implement it in their own organization. In a world where what you do now can quickly lose its value and become irrelevant, the issue is increasingly what you do next. Think about the speed of change in the external world. Think about the intensity of global competition. Think about the bargaining power of today’s customers. It is time for a new set of eyes, a re-focuse and a re-strategy for the new economy. We help companies and governments worldwide with their strategy to stay relevant in the future. We also provide keynotes and workshops to inspire you and to stimulate your innovation process. Creating a business friendly environment and an entrepreneurial ecosystem for existing small and medium-sized enterprises (SMEs) and potential entrepreneurs is most important for economic growth. We advice governments in developing SME-friendly policies and programmes to stimulate, support, and monitor the progress and effects. Education nowadays has many challenges. It is important for young people to acquire a broad set of 21st century skills as early as possible in life and to make sure that people develop the skills necessary for the jobs of today and tomorrow. This task is essential to boost employability, competitiveness and growth. CreativeMV gives advice on the development of entrepreneurial skills and bridging the gap between education and the labour market. We write killer project plans that get results and funding. Despite the considerable potential of Cultural and creative industries (CCIs), they remain undervalued and unrecognised, especially in terms of their ability to access start-up capital and financing. The challenges facing CCIs are compounded by a lack of clear evidence and information in the sector. CreativeMV gives advice to governments on policies and initiatives to develop the entrepreneurial skills of CCIs, to promote market access for and investment in CCIs, and by promoting innovation in education. Global tourism is one of the largest industries in the world. Tourism has a wide-ranging impact on growth, employment and social development. Challenges are security and safety, technology, economic competitiveness and changing markets. Having the right combination of tourism policies is critical for sustainable tourism growth. CreativeMV can help governments and organizations create policies that help meet the goals of the destination. We love sharing our latest knowledge and news with the whole world.